Taste test: We were VERY hungry after our 10 hours of flying from Boston to Hawaii, so when we spotted these chips in the local grocery store we grabbed a bag. Because we were so hungry, we ended up eating half the bag on the first night. These chips are kettle cooked in the Maui style, which is similar to the Cape Cod style. They are very crunchy, oily without feeling too greasy, and there is just enough vinegar on the chip to remind you that you're eating a salt and vinegar chip. 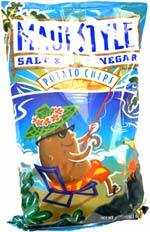 These are great chips, and if you're in Hawaii and are jonesing for some S&V chips, grab a bag of these. Smell test: Somewhat vinegary smell. 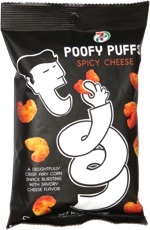 This snack was discovered by Keith and Melissa in Hawaii. Review published .